Everyone loves the start of summer and that first trip to the beach or pool. A new swimsuit is just the thing to welcome in the summer fun in a bright and colorful way. Made of soft spandex fabric and folded elastic around the arms and legs. Due to the pattern of the fabric, the suit pictured may not be exactly the same suit you receive. Dolls are not waterproof and should not be placed in the water! Swimsuits are for pretend play or display only. 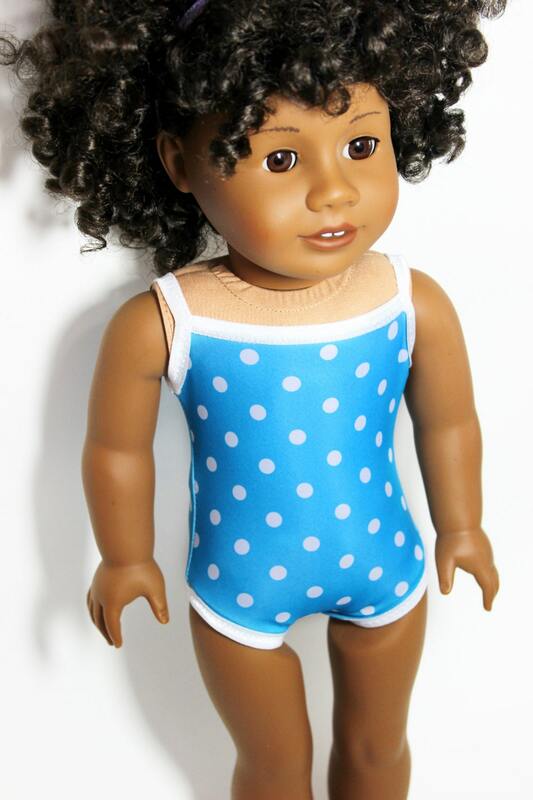 Lizziebee Designs is a one-woman studio specializing in handcrafted, quality clothing for American Girl, Springfield, Madam Alexander, Our Generation, and other 18" soft-body dolls. All of out outfits are handmade with the best materials and notions in a smoke-free home. All of our fabric is pre-washed when possible and all seams are finished to provide extra protection against wear and tear! Made with a Liberty Jane pattern, used with permission. Well constructed. Love the bright fabric!